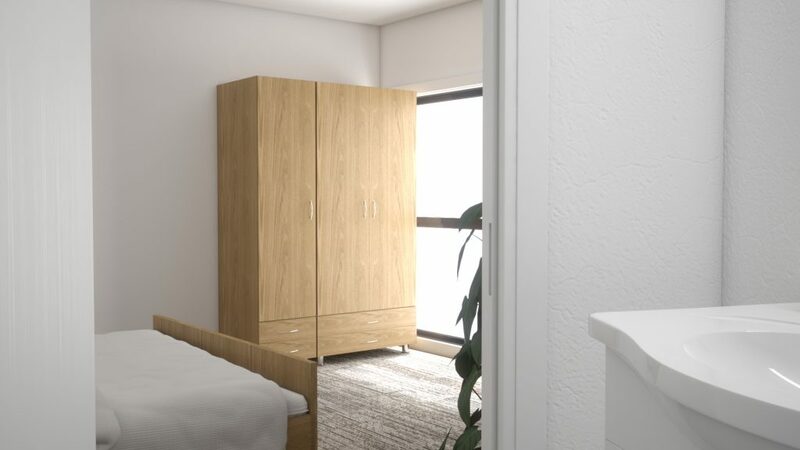 Conveniently located in the heart of Mawson Lakes next to the University of South Australia, Capital Student Stays consists of 212 fully furnished student only bedrooms, ready for occupancy from January 2019. Located above Romeo’s Foodland, a variety of dining options and numerous specialty stores, everything you need is right at your fingertips! Prefer the privacy of living alone? Our spacious, two-level 1 bedroom apartment is perfect for you. Enjoy your own private, fully-equipped kitchen and living space on the first level, followed by a large Queen bedroom and ensuite on the second level. 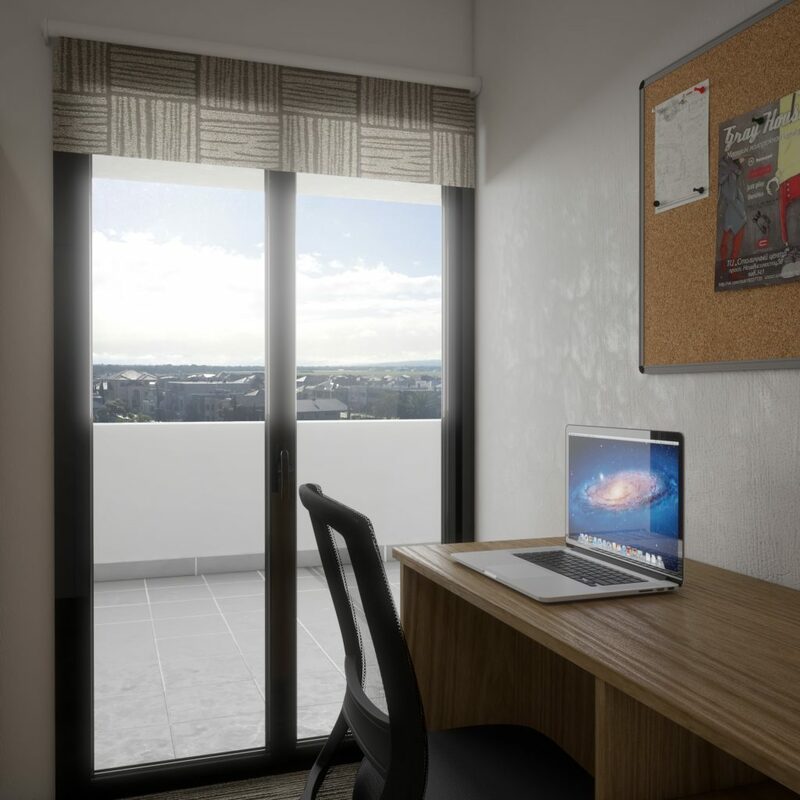 Accompanied by an abundance of storage, your own study space, over-sized windows and self-operated air-conditioning, our 1 bedroom apartment offers a spacious and peaceful lifestyle for any student. Enjoy the privacy of our modern and spacious Queen single-level studio apartment. Including your own fully-equipped kitchen and living space, accompanied by a modern accessible bathroom, this studio apartment is suited to those who prefer living alone, with their partner, or a student who may require a large, sing-level wheelchair accessible room to comfortably move around. If you’d like to share with a sibling, friend, or meet a new roommate, our 2 Bedroom apartments are for you. 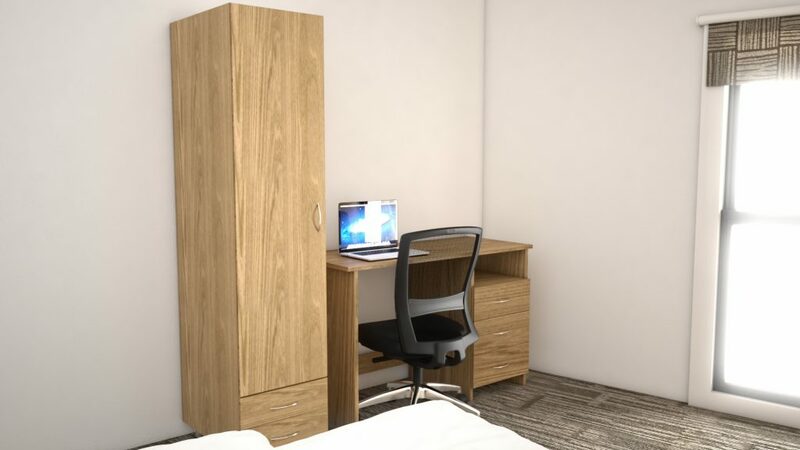 Fitted with a King Single bed, window, plenty of storage and study space, accompanied by a shared modern bathroom, kitchen and living space, these apartments are great for sharing with another student while still enjoying your own private space. If you’d like to share with a sibling, friend, or meet a new roommate, our 2 bedroom apartments are for you. 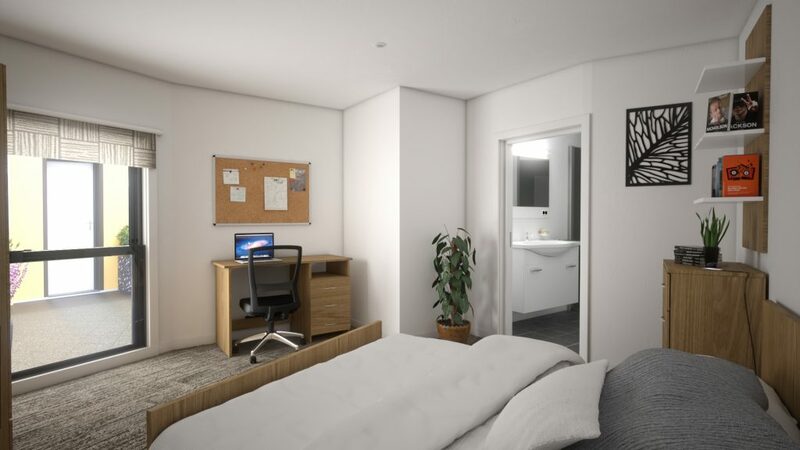 Fitted with your own modern ensuite, window, king single bed and study space, accompanied by a shared fully-equipped kitchen and living space, these apartments are great for sharing with another student while still enjoying your own private space. Prefer to share with a small group of friends, or to make new ones? Our 3 Bedroom apartments are for you. 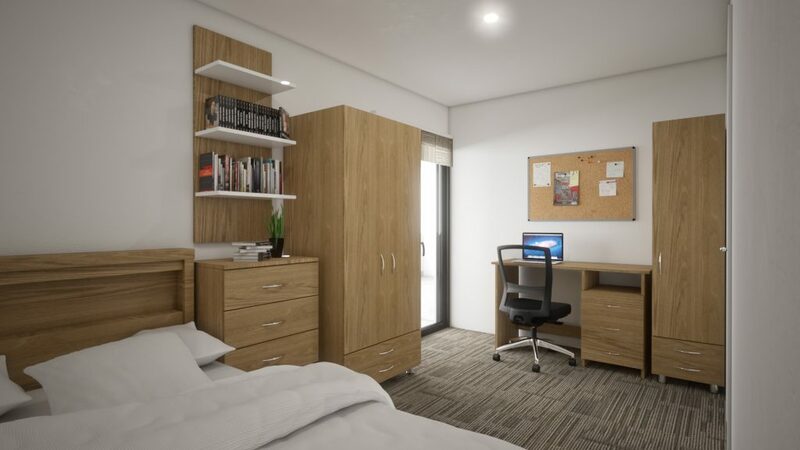 Fitted with a King Single bed, window, plenty of storage and study space, accompanied by a shared modern bathroom, kitchen and living space, these apartments are great for sharing with other students while still enjoying your own private space. Prefer to share with a group of friends, or to make new ones? Our 3 Bedroom airy and light-filled apartments are perfect for you. 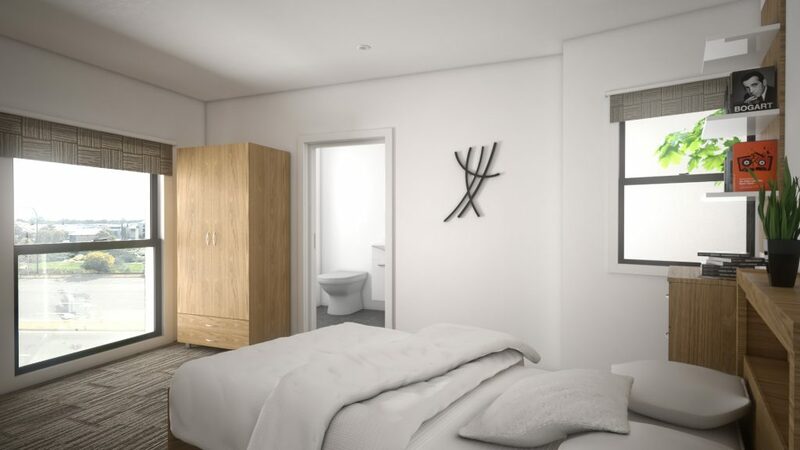 Fitted with a King Single bed, your own balcony and study space, accompanied by a shared modern bathroom, kitchen and living space, these apartments are great for creating new friendships while still enjoying your own private space. Prefer to share with friends, or to make new ones? Our 3 bedroom airy and light-filled apartments are perfect for you. 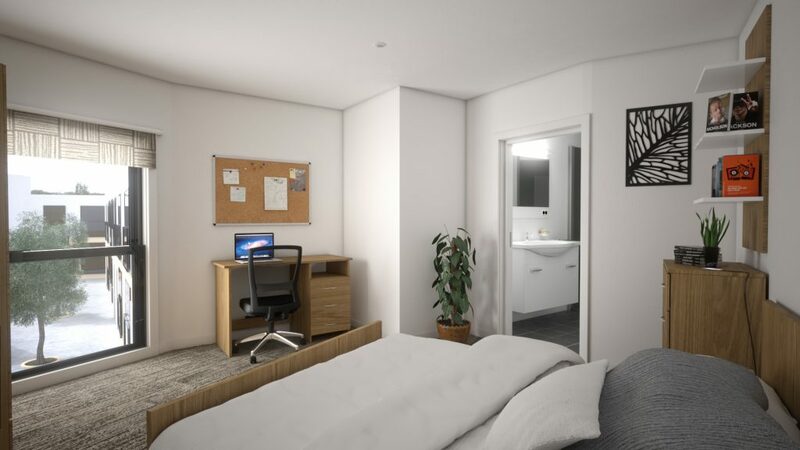 Fitted with your own modern ensuite, window, king single bed and study space, accompanied by a shared fully-equipped kitchen and living space, these apartments are great for creating new friendships while still enjoying your own private space. Prefer to share with friends, or to make new ones? Our 3 bedroom airy and light-filled apartments are perfect for you. Fitted with your own modern ensuite, large balcony, king single bed and study space, accompanied by a shared fully-equipped kitchen and living space, these apartments are great for creating new friendships while still enjoying your own private space. Prefer to share with friends, or to make new ones? Our spacious 3 Bedroom airy and light-filled apartments are perfect for you. Fitted with your own modern ensuite, balcony, King Single bed and study space, accompanied by a shared fully-equipped kitchen and living space, these apartments are great for creating new friendships while still enjoying your own private space. Prefer to share with a group of friends, or to make new ones? Our 4 Bedroom airy and light-filled apartments are perfect for you. Fitted with your own modern ensuite, window, King Single bed and study space, accompanied by a shared fully-equipped kitchen and living space, these apartments are great for creating new friendships while still enjoying your own private space. Prefer to share with a group of friends, or to make new ones? Our 5 Bedroom airy and light-filled apartments are perfect for you. Fitted with your own modern ensuite, window, King Single bed and study space, accompanied by a shared fully-equipped kitchen and living space, these apartments are great for creating new friendships while still enjoying your own private space.